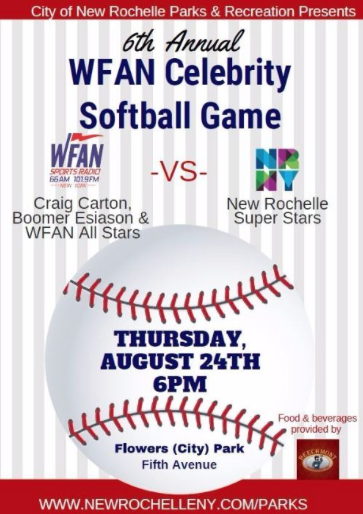 The WFAN All-Stars Celebrity Softball Game returns to New Rochelle on Thursday, August 24 at Flowers (City) Park on Fifth Avenue. 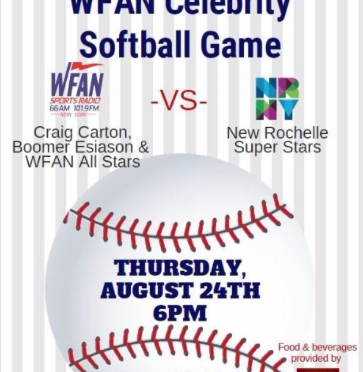 New Rochelle High School alum Craig Carton of the “Boomer and Carton” show and his superstar lineup will face off against our City’s best. Warm-ups begin at 5:30pm and the nine inning slow pitch game will start at 6:00pm. A food and beverage court area hosted by Beechmont Tavern will be open throughout the game. It’s a great way to get an up-close look at some of the biggest names in sports . . . and have a fun evening. Perfect for kids, too.